Above: Snow shovels come in handy for serious snow removal! So this weekend is supposed to bring a lot of snow down to the lower elevations followed by a cold snap. Since I worked in disaster preparedness at one time, I always have my pantry filled with food, candles and alternate light sources, battery back up, and an old phone in case the electricity goes out and, believe it or not, dial-up service which allows Internet access during times everything else is out. Just a reminder that you should have adequate fuel in your vehicle along with a shovel in case you get stuck or end up sliding off the road. Snacks, blankets, and extra gloves, jackets and boots are also good. At your home, be sure to prepare with alternate sources of heat in case your heating system is dependent on electricity for ignition or operation. Last year some locals were freezing because they were not prepared to lose electricity for the 3-6 days it was out. Now I wanted to chat a bit about snow shoveling, in case you need to pick up some additional hits and tips. Believe or not, I find snow shoveling therapeutic. I enjoy being outside and it also provides some exercise and a break from my normal writing schedule. 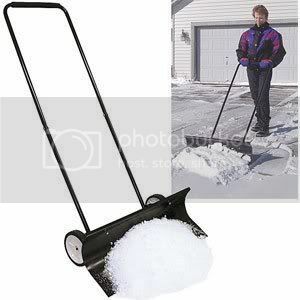 If you do not have a snow blower, or someone to help you, selecting the right type of snow shovel will help make your job easier and hopefully prevent muscle soreness and back injuries. There are a lot of different snow shovels on the market. The length of the handle is important because if it is too short you will be bending over to shovel which can be a pain and a lot more work. If it is too long, it might provide more leverage but the distance from your body might increase the weight and strain. The handle should be constructed from strong materials such as metal or wood since those materials are more durable but wood can eventually splinter. I find the blends of metal that are hollow tend to be strong and durable while also having the benefit of not adding additional weight to the job. The lighter handles of aluminum or plastic can be used for lighter snow but they tend to need replacement quickly. The blade of the shovel is also important and should not be too thin. Curved options can collect snow over time and get heavier during your efforts. One trick is to use a thin layer of cooking spray to help prevent any build up. The straighter blades are good for slicing into snow and tossing quickly. 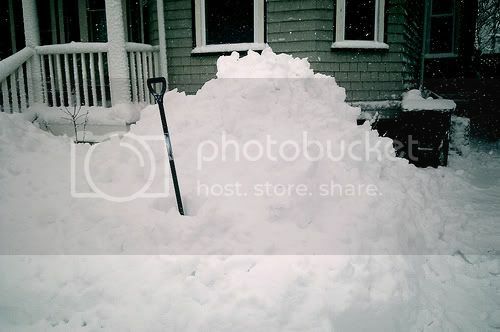 As a general rule, heavy snow and ice is best tackled with a shovel made of more durable material. Those with the aluminum and plastic blades tend to work well around more delicate surfaces (less damage) but they can bend, crack, and break more frequently, especially if the blade is too thin. Plus, they tend to lose their clean edge and so hang up on things and get increasingly more difficult to push snow or shovel. The size of the blade is also a factor since a smaller one is lighter and makes for lighter lifting and tossing. If you have a blade that is too wide and deep it can contribute to back strain. Now there are ergonomic snow shovels are designed for people who have back problems or little strength. The handle is bent and helps prevent strain when you are pushing or lifting snow. I tend to not like them since I have a few other tools in my arsenal. There are also snow pushers that are designed to help you push the snow, their blades are slightly rounded at the bottom so that any accumulation can be moved without lifting–but the catch is that they work better when there is not a lot of accumulation. Believe it or not, there are also shovels with a wheel like the Sno Wovel. It is easier to push and the blade lifts and flings the snow for you. Electric snow shovels or snow throwers are available but if you are going to consider one, I say just take a step up and get a snow blower. My house faces the south and so gets a lot of sun which helps keep the place manageable because within 24 hours or so the remaining snow and ice is melted away. However, if you create shade areas by putting up visual barriers such as weave in your chain link, the snow and ice remains a lot longer. It is also a good idea to clear any surfaces such as railings, tops of sheds or plant limb accumulations first. Otherwise after you clear you’ll find that you’ll have new deposits falling onto your cleared areas once a melt begins. Locals know that the secret is to get out right away to clear away the snow. If someone walks or drives onto your snow filled parking area or path, it packs it down and forms ice as well as creating a slippery hazard. Also, if you do not get out and break the berm or remove snow early, once the sky clears, the temperature drops and creates solid packs of snow and ice that are much harder to manage or remove later. In addition, removing all the snow can sometimes be a hazard if the thin layer melts and freezes. A more eco-friendly option is to use sand to help create a bit of traction if it does. Now I know that you have some great tips and hints to add–so share them in the comments and stay safe and warm this weekend! This entry was posted on Friday, February 25th, 2011 and is filed under Mountain Lake Resort, Small Town Living. LOL not a chance. I have enough therapy at my own house especially now!